Star New Zealand sprinter Bigtime Paddy will make his Australian debut at Sandown Park this Thursday night ahead of a tilt at the TAB Melbourne Cup in November. Bigtime Paddy (pictured above with Sam, Brendon and Georgie Cole along with co-owner Craig Rendle) arrives in Australia following an impressive run of form. 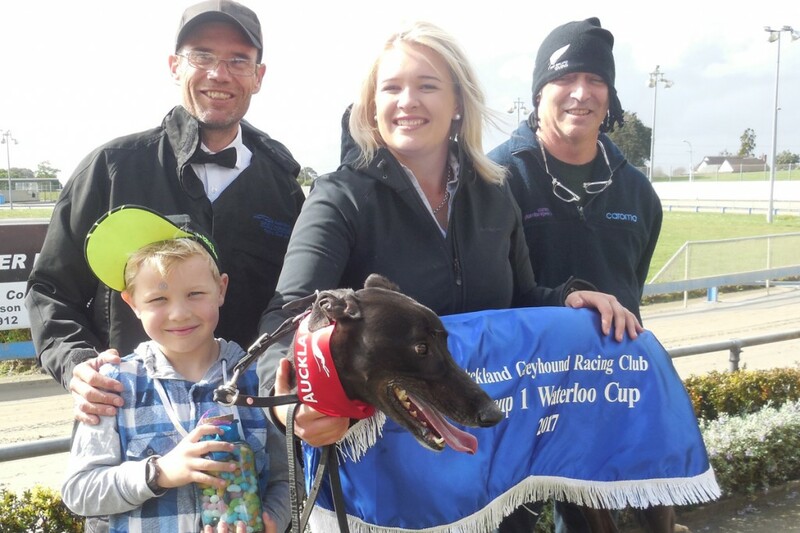 He won the Manawatu Cup in his final start before crossing the Tasman, just two weeks after securing New Zealand’s oldest feature event, the Waterloo Cup. The Waterloo Cup win granted Bigtime Paddy an exemption into the TAB Melbourne Cup heats on Friday 17 November, presenting an opportunity connections had no hesitation in embracing. “We were ecstatic, and it was very good for Craig Rendle who has been a big part of the set up and has a big involvement as owner. It was also very pleasing for the staff, they work so hard and are very proud of the dogs,” co-trainer Brendon Cole told NZ’s TAB Trackside. 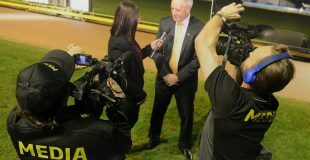 “It’s been a plan of mine to breed dogs, get them across the Tasman and compete in the big races. This is part of the dream. Bigtime Paddy will have his work cut out for him on his Sandown Park debut where he’s drawn box 4 against the likes of Raw Ability, Leo’s Gift, Zipping Angus, Riley Tokaam and Rippin’ Hayne. “Their fifth grade racing is like our group racing over here. You really need to be able to keep your line and withstand the pressure from dogs coming around you. Only two New Zealand greyhounds have contested a Melbourne Cup final in the race’s 61 year history. Kwik Metal won the Cup in 1974, while Above All finished fourth in the 2014 edition. Both greyhounds came to Australia after two race starts in the native land before continuing their racing careers in Australia. Bigtime Paddy is the first New Zealand greyhound to contest the Melbourne Cup series since the Waterloo Cup was granted exemption status in 2015. Bigtime Paddy will race under the guidance of John Galea during his Australian sojourn. Click here for Thursday’s fields and form.